I can still remember the disappointment I felt when this album came out. This was back in 1976 and I had just discovered Budgie. I had ordered all the older albums, except the first album, and during that period they were one of my favourite band. Earlier songs like Young is a world, Breadfan, Parents, I can´t see my feelings and Napoleon Bonaparte followed me most every day. And since those were the days long before internet there were no information to be found about this mythical group. My expectations were very high as I longed for their next album. So when, finally, IIWBIWTR was released I ran to my local record store and bought it. The first song Anne Neggen made me a little nervous - was this the perfect choice as a starter? Burke Shelley sounded...uninspired..sort of....the production quality wasn´t bad but the sound felt empty. Well...hopefully things should get better. But as If I Were Brittania I'd Waive the Rules started things were getting clear - this wasn´t the hard rock band I had learnt to love. Instead it sounded like they were flirting with the fusion génre. 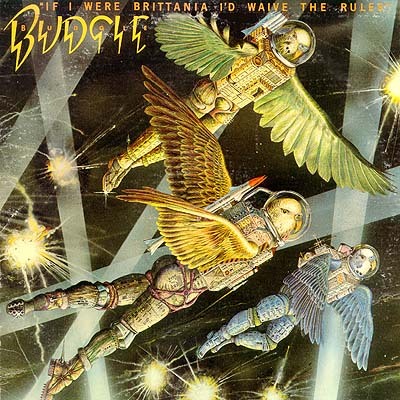 You´re opening doors was a ballad - but that should be a good thing since Budgie had delivered such charmy and emotionally short ballads one their earlier album. Well....YOD was not another one of those. Instead of a melancholy acoustic-based song it was a rather boring attempt. I also began to ask myself - were are the guitar solos? Three songs and not a solo so far! Quacktor and Bureaucats was a minor positive step in the right direction since it had charm and some nice guitar licks. Sky High Percentage felt ok at first - it reminded me of the style on Bandolier - but unfortunatly it just went on for several minutes in a repetetive way. Heaven Knows Our Name - another ballad. This could have been a fine one if it wasn´t for the bad singing! Is it really Burke singing at this? My guess it that someone else was doing the mic on this one. Finally Black Velvet Stallion made me kind of interrested. A ghostly mood surrounds Shelleys voice and there is a feeling of doom over it. Maybe, finally, a real memorable epic can save this album? Well...actually no! This could have been something really good, but Budgie didn´t use the time and mood in a positive way. The song never lifts. One can just imagine how good it could have been if they had made this song more progressive. One positive thing, though - finally Tony Bourge blasts away a dynamic guitar solo. It may be one of his best solos! Today I can appreciate the titel track (IIWBIWTR) because my musical taste has changed a little over the years - apart from that I still fell that this was their least inspired album of the seventies.